Weed Control in Idaho Falls | YardTech, Inc.
Have weeds taken over your Idaho Falls, ID property? There are a number of factors that can cause weeds to grow and multiply, but if you’re looking to preserve your lawn or yard, you may need professional intervention. Fortunately, our weed control specialists can help. 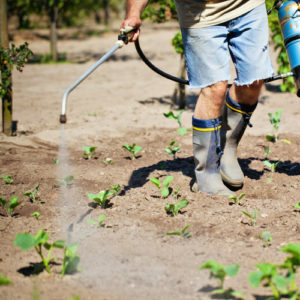 Our knowledgeable team can come in and implement weed control methods to curtail the growth of unwanted weeds and prevent weeds from sprouting up in the future. Weeds can mar your property’s exterior and make your lawn or yard look neglected. Don’t struggle with weeds on your own when our professional team can help. We pride ourselves on excellent service and reasonable weed control rates. And our courteous landscaping professionals will go the extra mile so that you come away satisfied with our service. It’s time to eliminate weeds and restore your lawn or yard to a more appealing state. To start your weed control treatment, call us today for an appointment. We use professional herbicides that target hard to kill weeds such as clover, thistle, crabgrass, spurge, purselane ,and puncture vine, as well as common pests like dandelion, black medic, and ground ivy. Customers who sign up with us for the year (3 or more applications) will receive free grub control with the second application which will provide protection from these pests for several months. Fall applications will consist of weed control that will carry over in the following spring with important micro-nutrients that will leach into the soil, go dormant for the winter, and release in the spring to help green up your lawn in early spring.